Today I found out the Earth is hottest when it is furthest from the Sun on its orbit, not when it is closest. During the period when the Earth is furthest from the sun (aphelion), the average temperature of the entire planet is about 4°F (2.3°C) higher than when it is closest to the sun (perihelion). On average, the intensity of sunlight falling on Earth during aphelion is about 7% less than during perihelion. Despite this, the Earth ends up being warmer during the period in which it is furthest away from the sun. So what’s going on here? During the winter months, for the Northern Hemisphere, the overall temperature of the Southern Hemisphere, where it is summer, doesn’t change as much as the other way around. This is because a much larger portion of the Southern Hemisphere, compared to the Northern Hemisphere, is made up of water and water has a significantly greater heat capacity than land. On a similar vein then, during the summer for the Southern Hemisphere, the overall average temperature of the Southern Hemisphere doesn’t increase as much as the Northern Hemisphere does during its summer, for this same reason. So the “tl;dr” version is: there is a lot more land in the Northern Hemisphere than the Southern Hemisphere; this land heats up much faster than water and water cools down much slower than land. So even though there is less intensity of sunlight during the summer in the Northern Hemisphere, the Earth’s average temperature is higher at this time when it’s furthest from the sun. 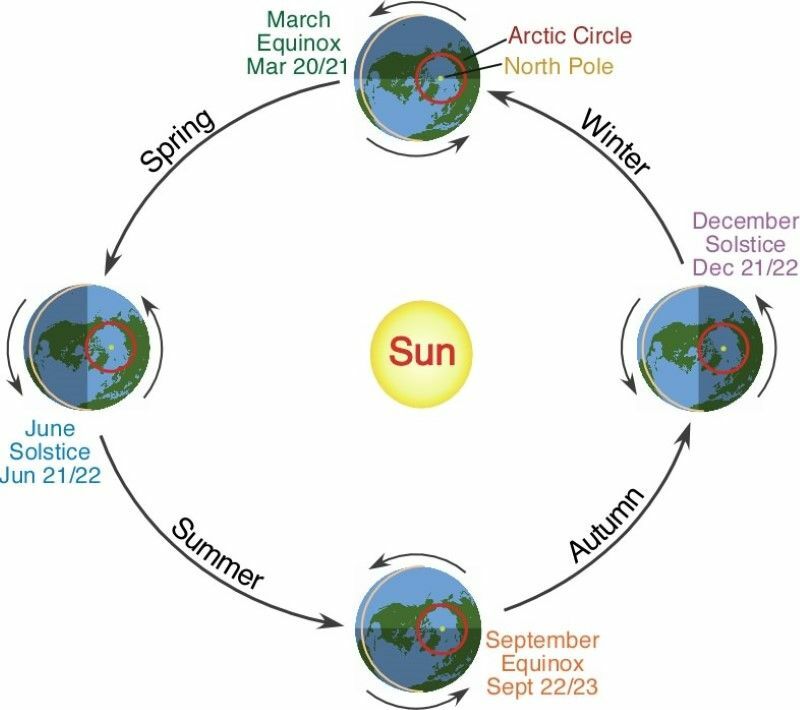 As you might have guessed then or already known, the seasons are not caused by the distance the Earth is from the sun, but rather are caused completely by the fact that the Earth is tilted on its axis 23.5°. This is why when it’s summer in the Northern Hemisphere, it’s winter in the Southern Hemisphere, and vice-verse. Without this tilt, there would be no seasons and the weather from day to day across the globe would be relatively uniform. In this case, there would only be a very slight variation in temperature as the Earth got closer or further away from the Sun, but for the most part, everything weather-wise would stay the same year round. The Earth orbits the sun at a speed of about 18.4 miles per second or about 66,600 mph. The Earth is about 28,000 light years from the center of the Milky Way, on the outer rim. Most all the mass in the Milky Way is much closer in than we are; this is good because, if the density was the same out here as it is closer to the center, the increase in cosmic radiation would kill us all. All planets in our solar system travel around the sun in elliptical orbits. The distance to the sun for the Earth varies by about 1.7%. We are closest to the sun in January (perihelion) at about 91.1 million miles (146.6 million km). We are furthest from the sun in July (aphelion) at around 94.8 million miles (152.6 million kilometers). The average distance from the sun to the Earth is known as 1 Astronomical Unit, (1 AU or about 93 million miles). Summers in the Northern Hemisphere last 2 to 3 days longer than summers in the Southern Hemisphere. The reason why is that the Earth moves more slowly at aphelion than at perihelion. The date of the period where the Earth is furthest away from the sun is called Summer Solstice. The date at which the Earth is closest to the sun, is called Winter Solstice. Summer Solstice happens on June 21/22. Winter Solstice happens on December 21/22. In between these two points, there is a point in time where the Sun will appear to rise and set along the equator, so that the length of night and day is almost exactly equal everywhere on the planet. These two points are called the vernal equinox (March 20/21) and autumnal equinox (September 22/23). The average temperature of the Earth year round is around 61°F (16.1°C). The average coldest temperature on the Earth, in Antarctica, is around -60°F or -51.1°C and the average of the hottest part of the Earth, in the Sahara Desert, is around 130°F (54.4°C). The hottest temperature ever recorded on Earth was 136°F (57.77 °C) in El Azizia, Libya on the edge of the Sahara Desert. The second hottest, 134°F (56.6°C), was recorded in Death Valley, California in the Mojave Desert way back in 1913. The coldest temperature on the Earth was recorded at Vostok, Antarctica on July 31, 1983 at -128.6°F (-89.22°C). Unlike the Earth, which is only shifted about 23.5° on its axis, Uranus’ spins almost perpendicular to the sun. Interestingly, despite this fact, Uranus is hotter at its equator than at the poles. The reason why this is the case is not currently known.